Black Batman starts cursing and threatening a guy...in front of kids. 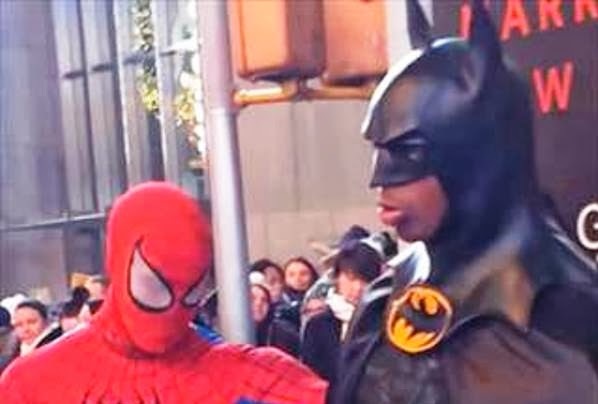 So, there's a video making the rounds that shows a guy dressed as Batman going off on a guy and getting talked down by the cops and a couple of guys dressed as Spider-Man. My first reaction was to laugh, but then I saw the guy playing Batman is Black and it sadly made perfect sense: It's another example of "keeping it real" going horribly wrong. It's another sad example of a young black man taking "keeping it real" too far. The saddest part is seeing kids walking right past him while he keeps cursing. Those kids will never enjoy Batman Begins again. It is pretty funny though. Especially when the guy dressed as Spider-Man assures Batman the other guy isn't "gangsta." What do you think of the video? Is it another example of keeping it real going wrong?